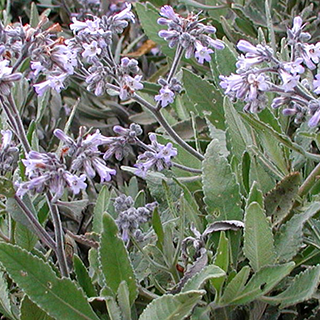 A native of California and New Mexico, Yerba Santa is an evergreen shrub with smooth stems that are coated with sticky resin. It has smooth yellow-tones leaves that are thick and leathery with a deep middle seam, and it blooms with blue flowers in clusters. Tear 3 leaves (fresh or dry) and place into a cup with boiling water for colds or sore throat. Let steep for 15 minutes. Grind 10 leaves per cup of alcohol and add to a mason jar. Shake twice daily and let steep for at least 1 month. Strain into dropper bottles, and take 1 drop, 3 times daily as needed. Boil leaves, let steep for 15 minutes, strain, and add 2 parts honey to 1 part tea. Dry, grind, and smoke for colds and asthma. Yerba santa is propagated by its seeds that are sown in a greenhouse in spring. When the seedlings have grown sufficiently to be handled, prick them out individually and plant them in separate pots. It is advisable that you grow the young plants in a greenhouse at least for their first winter and plant them in their permanent positions outdoors during the later part of spring or early summer next year. The plant can potentially be harvested from April to November.